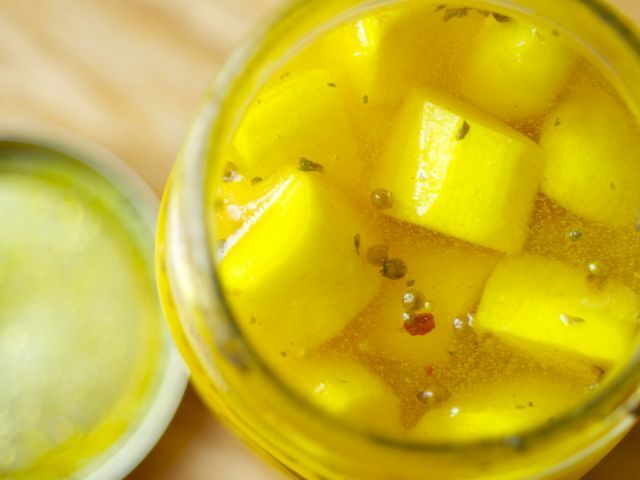 These pickles are wonderful with any cold meat dishes or charcuterie. The basic version takes a week to make, but there's a quick method here too, for overnight pickles. Combine the garlic, herbs and spices, salt, water, vinegar, and olive oil in a bowl. Stir to dissolve salt. Pack the turnip wedges into a clean quart jar and pour in the brine mixture. Screw on the lid. Put the jar on a shelf in the kitchen and turn it over every day for a week. After a week, refrigerate the pickles. Use within a month. (In a hurry) Quick Pickled Turnips: For a faster pickle, simmer the turnips in the brine for about 8 minutes, or until cooked but still firm. Cool the pickles in the brine, then refrigerate overnight before serving. (Feeling pink) Pink Pickled Turnips: For pink pickles, add 1 small red beet, peeled and sliced, and omit the turmeric.